Get Baby to Talk with These No-Prep, 5-Minute Activities! | Speak. Play. Love. 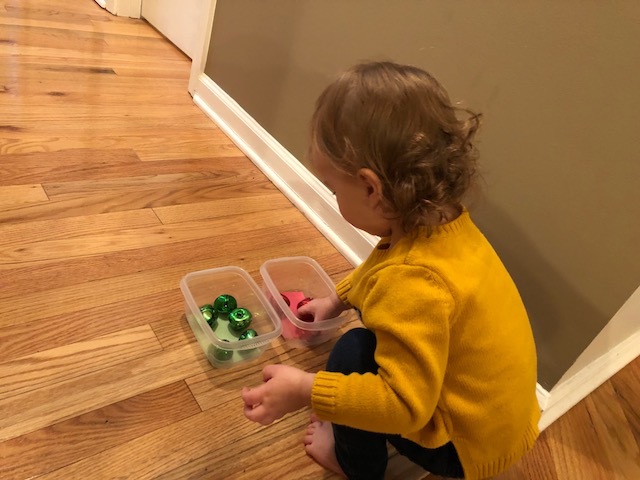 Whether you are hoping for that precious first word from your child OR you are wondering how to encourage your toddler to talk more, the following ideas are designed to be high-interest, 5-minute activities to sprinkle throughout your week! 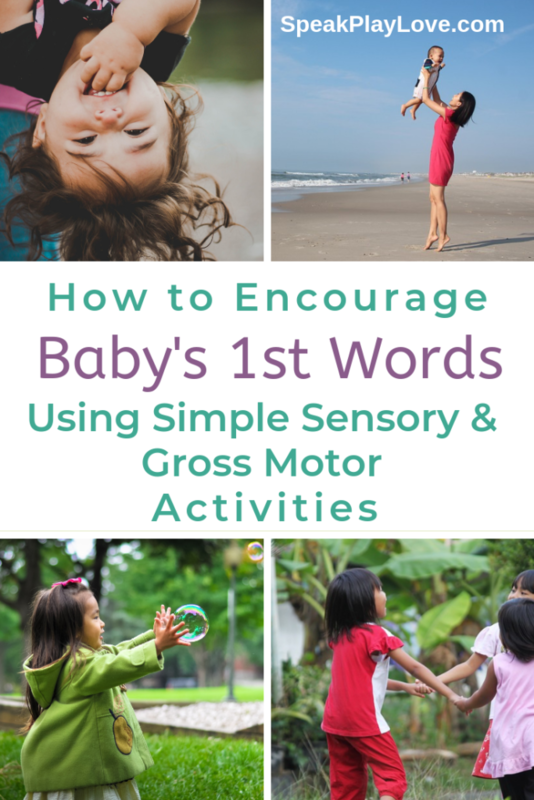 You’ll notice that most of these activities incorporate movement and/or sensory aspects to really get your little one engaged and to get baby to talk. The key here is getting the momentum going with the activity by repeating the movement or activity several times before adding an Expectant Pause (more about this below). Pick an activity listed below. For this explanation, I’ll use the example of tipping your child upside down. 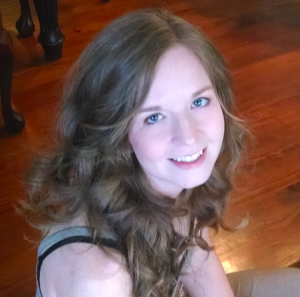 Watch for your child to become really engaged (giggling, smiling, waiting for more, etc.) You might repeat this 3-5 times. Then instead of saying, “Ready, Set, Go!” You are going to just say, “Ready, Set. 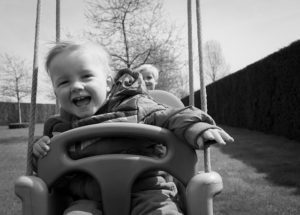 . . .” and look at your child with an excited, expectant look. I call this the “Expectant Pause.” Wait a few seconds. 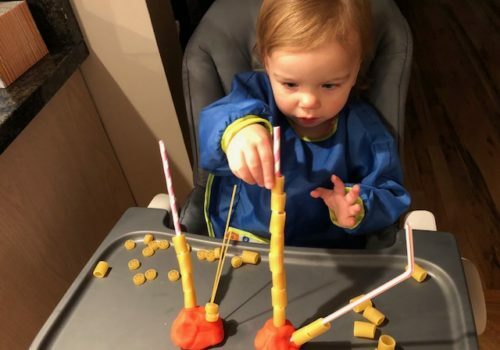 You don’t want to get your child overly frustrated, but you want to give several seconds of wait time to give him the chance to say “go” (or anything that sounds close – we are looking for communication intent in the beginning, not perfection). 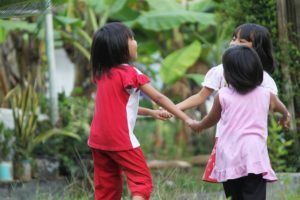 If you child says, “go” or something close (maybe just “oh”), quickly do the movement. Then celebrate and praise him, “Wow! You said ‘go!’” If he doesn’t say anything, you can model the word and then immediately do the movement so that he learns to link the word to the action. 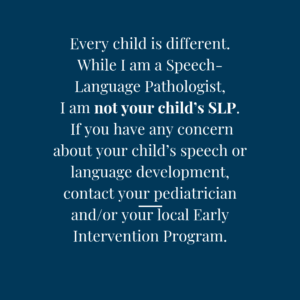 *Note: These activities also can work for children who are using alternative ways to communicate including American Sign Language, “baby signs,” PECS (Picture Exchange Communication System), or high-tech AAC devices, such as voice-generating apps on a tablet. 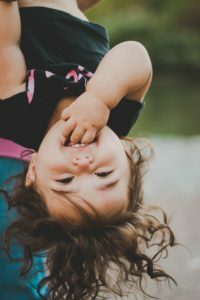 Depending on the child’s age and how much she likes the sensation of being upside down, you can adjust how you get her upside down and for how long. Using a big squishy pillow (a couch throw-pillow works best at our house), gently “squish” the pillow onto your child’s body for a few seconds, making sure to avoid the face. 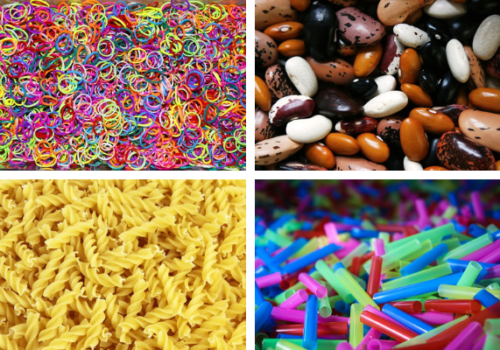 This provides an all-over pressure that a lot of kiddos love. Plus, it’s silly! Want to get your baby giggling and get an upper body workout all in one? Hoist your baby/toddler up above your head. My husband even gives our daughter a little air! Have your child lie on the ground and roll the ball up and down her body. Sit your child on top of the ball as you support her and bounce her up and down. Do this 2-3 times to familiarize your child with the game and song. Then, once your child knows what is coming and is looking forward to falling down, use an Expectant Pause before you say, “down” and fall. That will give him the chance to say “down” so that he can get to the fun part! Do this 2-3 times to familiarize your child with the game and chant. Then, once your child knows what is coming and is looking forward to the falling down part, use an Expectant Pause before you say, “down.” That will give her the chance to say “down” so that she can get to the fun part! 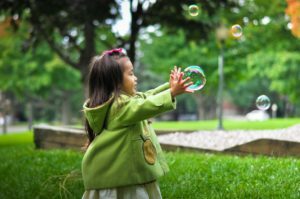 Bubbles are a classic, stand-by for Speech-Language Pathologists during therapy with toddlers. They have a great way of being both calming and exciting at the same time! Blow a few sets of bubbles, then start using an Expectant Pause to see if you can get your child to request. My favorite bubbles are Fubbles – No Spill Bubbles – you can check them out on Amazon by clicking here. 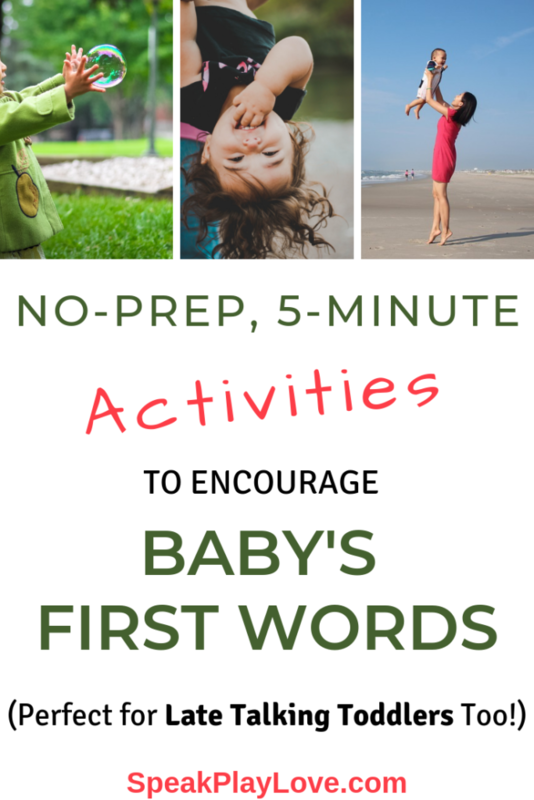 Hope you have fun with these activities and get those precious first words soon! Thanks for reading! Great ideas! I love the idea of incorporating songs and fun into using words. Thank you! These are really neat ideas. It was funny to think about how we already do some of these things without even thinking about how it encourages language development. I will be sure to be more mindful of ways to sneak in some target words.